The store was divided into departments: Full-Serve (behind the counter), Self-serve (several black-and-white copiers and a couple of color ones) and Computer Services. Computer Services at its height had two Macs and four PCs. During the two weeks before finals, there could be a line waiting for three hours. These were mostly the Design students, coming in groups to print out their final projects. Usually, the computers and printers were self-serve. They had software on them that kept track of time and prints and the student would get a bill and leave. During these times, vacations for staff were on hold. Over the years, I had more than one student tell me, “They teach us design, not how to use the programs.” So we staffed an extra person on overnights to help exclusively in the CS department. And that’s the attitude I’ve had about Photoshop for many years. Photoshop was for images, Illustrator or InDesign was for type. Of course, those two programs aren’t going to be replaced by Photoshop. Photoshop is not the first choice for long swaths of type, but if you want to work on a poster or book cover, there may not be a need for venturing outside of Photoshop. The left picture is a flattened Photoshop image. You can see that the type has the pixilated look you’d expect from rasterized type. The image on the right is an Acrobat file that was saved out of Photoshop. It retains its vector information. The one thing to keep in mind is that the effects on the type (bevel and pattern overlay) have been rasterized but the stroke keeps its vector information. Even the intersection of the vector and raster of the image looks crisp. While the settings depend on your printer’s requirements, this method will be fairly similar in most print situations. Chose File>Save As. 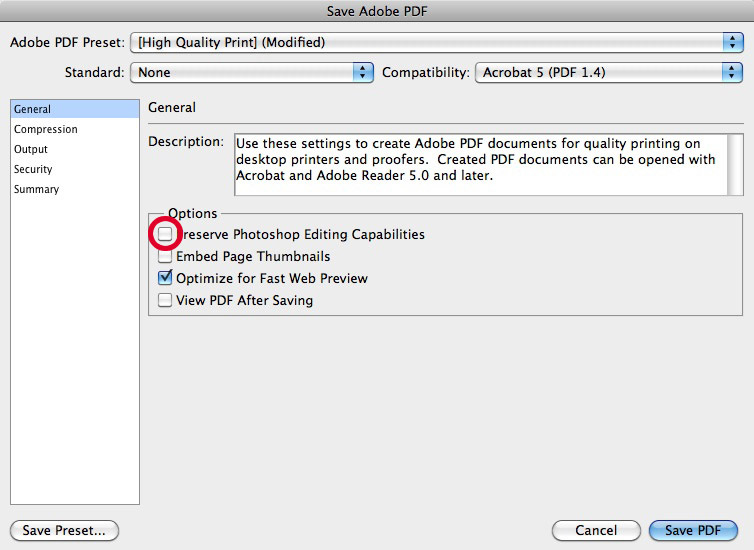 Under the Format drop-down choose Photoshop PDF. Uncheck Layers as this won’t add anything to the file except file size. 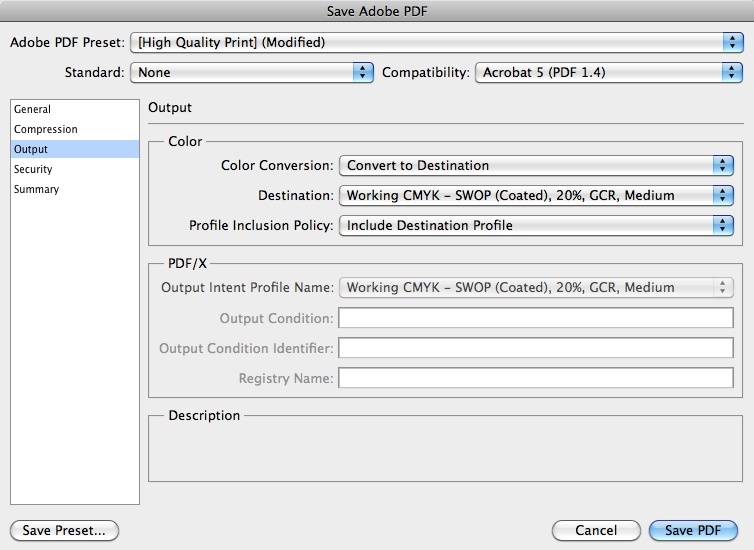 You might get a warning box saying that “The settings you choose in the Save Adobe PDF dialog can override your current settings in the Save As dialog box.” Click OK and you will go on to the Save Adobe PDF settings dialog. By default, the “Preserve Photoshop Editing Capabilities” box will be checked (the warning box wasn’t kidding, this is the same as having the Layers selection checked in the Save As dialog) so uncheck it. Assuming that you were working in RGB, select “Output” and choose “Convert to Destination”. The drop-down menu will give you several choices, so you should get the settings from your print provider to make the proper selection here to get the best results. Then select Save PDF and you’re finished. Smooth type from Photoshop!